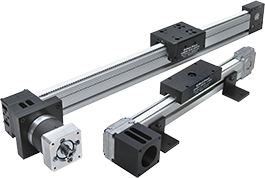 Del-Tron’s linear ball slides and linear crossed roller slides offer engineers and designers the flexibility to choose the right linear slide technology for their application. Our ball slides and crossed roller slides offer several levels of precision ranging from a straight line accuracy of 0.0005” per inch of travel in our standard precision ball slides to 0.0000040” per inch of travel straight line accuracy in our high precision ball slides and crossed roller slides. Available with inch or metric holes and hole locations these factory preloaded, low friction, light weight linear slides are ready for installation right out of the box. For vertical applications involving higher speeds and cantilevered loads please consider our Anti-Creep linear ball slides. These linear slides contain a one piece ball retainer to maintain the position of the ball bearing retainer. Other industry terms for linear ball slides often include ball bearing slides, linear slides, linear motion slides, ball slides, ball slide assemblies, roller tables, linear bearings, and linear ball slides. Additional terms for crossed roller slides include roller slides, cross roller bearings, linear crossed roller slides, crossed roller bearings, and more generally as linear actuators, linear motion slides, or simply motion slides.